CRAZY DISCOUNT! Was: $159.95 Now: $49.88! Make an exclusive place for your lovely cats to enjoy their private playtime with the 2-Level Cat Scratching Post Tower Pet Climbing Frame Scratcher Barrel House. 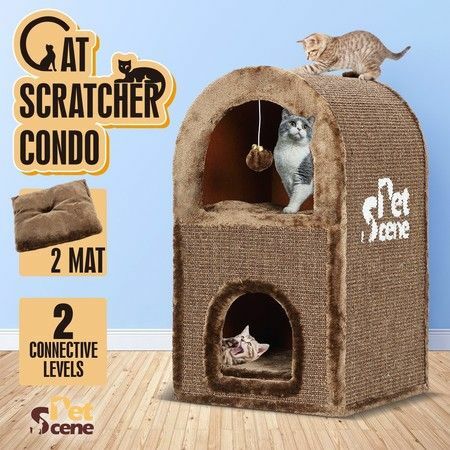 This stylish plush and sisal covered cat scratching post has a comfortable plush platform and a relax bed, which make it a terrific cat stuff for them to scratch, rest or jump up and down. The high quality woven sisal surface makes this cat scratcher a perfect toy for conditioning their claws, so never need to worry that they will scratch your luxurious sofa or any other furniture. The cat scratching pole features a sturdy construction ensuring safety while cats are playing with it to fully stretch their back and shoulder muscles. 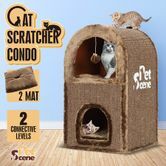 Let your lovely little creatures enjoy the entertainment with this cat scratching barrel house! Thank you yes it got delivered but my cats dont like it..lol. Perfect. Will be getting the larger one soon.